We visit some of the greatest gems on Turkey’s southwest coast aboard a glorious traditional Turkish gulet. This tour offers a marvellous combination of superb archaeological sites and a remarkably beautiful maritime landscape – a gorgeous and undeveloped stretch of Turkey’s turquoise coast. 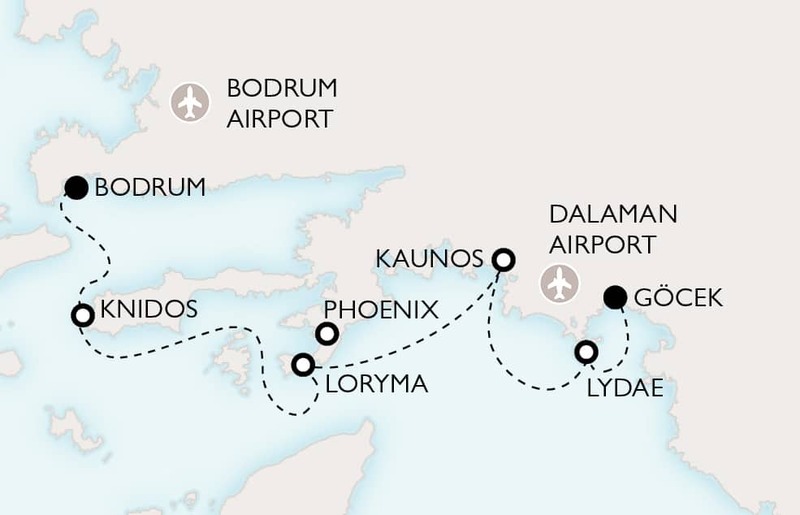 Starting from the lively harbour of Bodrum, ancient Halicarnassus, the birthplace of Herodotus, this cruise follows the convoluted shoreline of Caria, made up of deep inlets and long peninsulas forming a complex and diverse geography where land and sea constantly embrace one another. It ends at Göcek, a quiet small town in a lovely setting on the Gulf of Fethiye. Along the way, you’ll visit a series of fascinating ancient cities including Knidos, in a stunningly beautiful peninsular location with twin harbours and spectacular Kaunos, overlooked by uniquely elaborate rock-cut tombs. You’ll also explore more remote spots, such as the mighty Rhodian fortification at Loryma, one of the best examples of defensive architecture to survive from antiquity, the virtually unknown town of Phoenix, surrounded by evocative grave monuments, and long-forgotten Lydae, hidden away on a wild promontory far away from roads, towns and modern life. As well as the archaeological adventures and walks through landscapes of unforgettable beauty, you’ll have many opportunities to just sit back and enjoy the magnificent scenery or dip into the clear blue waters of the Mediterranean – a perfect combination of cultural experience and quality time. Day 1: Our boat is in Bodrum harbour about 40 minutes from Bodrum airport. Welcome drink and dinner on board. Day 2: South to spectacular Knidos, where decades of digging, still ongoing, have revealed a beautiful and well-planned city. Set at the very tip of a peninsula, its superb double harbour could be accessed from both east and west, providing protection for generations of ships and making it rich from the lucrative seaborne trade. Day 3: To Loryma, a magnificent Rhodian fortress guarding a strategic bay, a glorious spot for a swim. Day 4: We head inland to explore Phoenix, a wild and remote citadel city, with beautiful landscapes and grand vistas all around. Day 5: Heading northeast we take a boat through a lagoon into the reed lined Dalyan River to see the city of Kaunos. Its monumental public buildings, surrounding a silted-up harbour, speak of its once great wealth and fame. Day 6: A leisurely morning cruise to the beautiful inlet of Ağlımanı, where we will walk up an ancient track to the ancient city of Lydae. Monumental tombs stand on the crest of a hill overlooking a forgotten valley filled with the tinkle of goat bells. Day 7: A day of pure relaxation as we make our way to Göcek, at the head of a beautiful island studded bay. Day 8: Transfer from our gulet to Dalaman airport, about 30 minutes away. We plan for the gulet to depart Bodrum Harbour (approx. 40 mins from Bodrum Airport) around 17:00. Embarkation is from 15:30 onwards. You are more than welcome to arrive earlier to drop off your bags, but please be aware that the crew will be busy cleaning and tidying making everything ready for your group so you may not be able to settle in to your cabin. If you arrive to the gulet after 17:00, we will do our best to enable you to join the tour at a convenient time and place. Departure time can be subject to change depending on weather, harbour or other conditions. Disembarkation in Göcek (approx. 40 minutes from Dalaman airport) is around 09:00. We will arrange local transfers from Bodrum Airport and to Dalaman Airport on the first and last day of the tour. If you are thinking of extending your trip to Turkey to include visits to Cappadocia, Istanbul or further afield, please contact our office for further information. Our Carian Coast tour was really well organised with highly competent and experienced captain and crew , tour guide (Cem) and Archaeologist (Olivier) all contributing to make this trip a fantastic experience . Scenery and water was stunning. Touring party was very well catered for, nothing was too much trouble which made the trip very relaxing and enjoyable.